The study shows how a protein called polyglutamine-binding protein 1 (PQBP1) acts as a front-line sensor and is critical to initiating an immune response to HIV. When the PQBP1 encounters the virus, it starts a program that triggers an overall protective environment against infection and enhances the production of virus-specific antibodies. 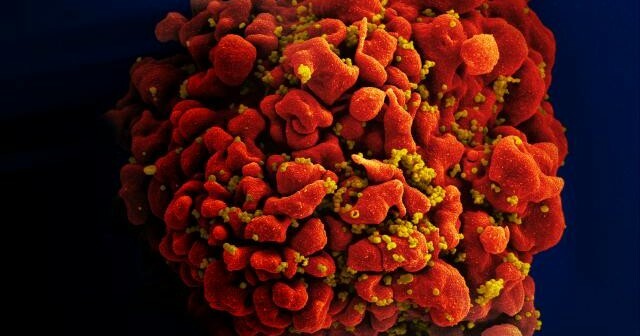 Human cell infected by multiple HIV particles. Courtesy of Sanford-Burnham Medical Research Institute. Although the major target of HIV infection is CD4+ T cells, dendritic cells are one of the first cell types to encounter HIV during sexual transmission. After HIV infects cells, its DNA forms an interface with PQBP1 in sentinel dendritic cells and initiates the immune response. Dendritic cells control the innate immune response—a generic, non-specific defense against pathogens. These cells also activate the adaptive immune response that generates highly specific antibodies that provide protective, long-lasting immunity. Both the innate and adaptive immune systems are necessary to provide an optimal immune response to vaccines.